Dr. Sanders is board certified in the Atlas Orthogonal technique. Atlas orthogonal is an effective and gentle chiropractic technique that aligns the spinal column allowing your nervous system to function optimally and your body to heal itself naturally. But what does the term actually mean? And how does the technique work? The Atlas is the top cervical bone in the neck. You can imagine the atlas as the first "link" in the "chain" that is your spinal cord. As such, this small bone can affect the alignment of the whole spine when misaligned. 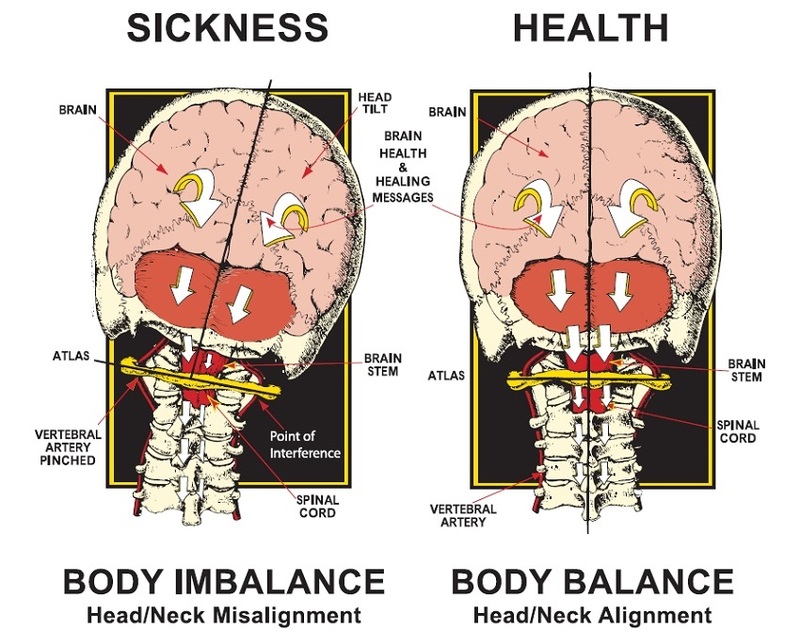 Your body is aligned when your head is centered above your feet. But if the atlas becomes unaligned, it causes your head to tilt and the spine to shift in an attempt to support the head in its new position. This puts undue stress and strain on your muscles, causing tension and pain. When the head is shifted off the center of the top of the neck, the rest of the body will compensate for the shift of weight. The spine and pelvis will twist, causing one shoulder to drop down and one hip to pull up, bringing the leg with it to create body imbalance. 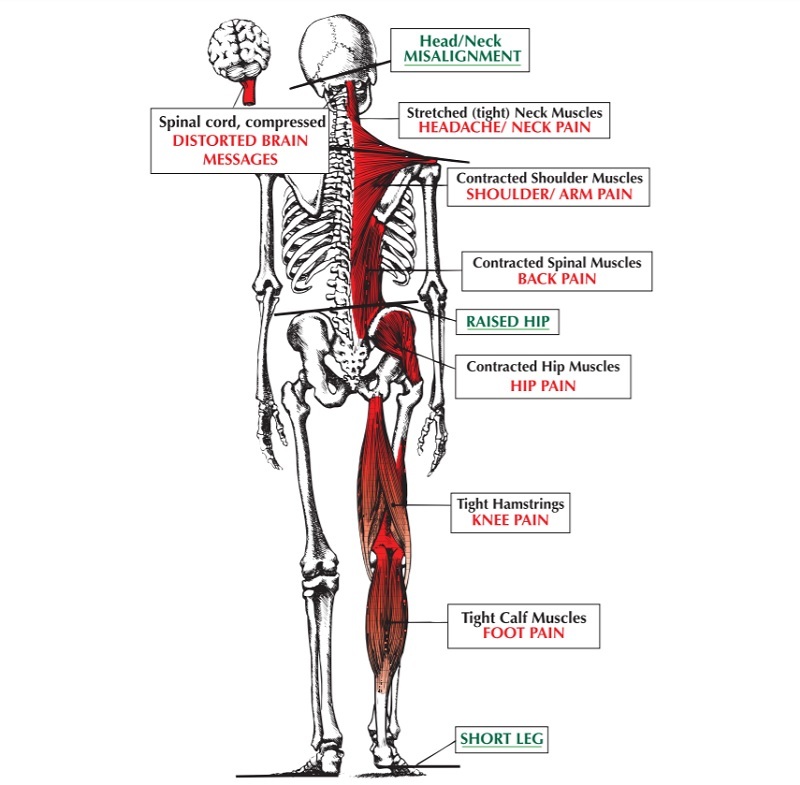 The resulting stress and tension on the muscles can cause pain anywhere in the body. In addition, when the spinal column is misaligned and out of balance, the nervous system is unable to function as it was intended, causing a wide array of problems that may include neck and back pain, headaches, TMJ, digestive problems, numbness, vertigo and many other serious issues. That brings us to our second term, "orthogonal." Orthogonal means at a right angle, or square. Atlas Orthogonal is therefore the technique that returns the atlas to its aligned position at a 90-degree angle. By doing so, we straighten the spine and allow the nervous system to function properly, thereby preventing or correcting many serious health conditions that have a significant impact on quality of life. Head/neck misalignment can disrupt or distort brain to body communication. This leads to the development to numerous acute and chronic health problems. Atlas orthogonal is designed to restore the body's natural ability to regain and maintain optimal health without the use of drugs, painkillers and their harmful side effects. If you've been to see a traditional chiropractor, you've probably been stretched, bent, cracked and popped in ways you didn't even realize were possible. Admittedly, some of those adjustments can be pretty uncomfortable. Fortunately, Atlas Orthogonal is much easier than that. To adjust your atlas, we use an Atlas Orthogonal Precision Adjusting Instrument. This instrument may sound intimidating, but it's actually completely painless - literally, you won't feel a thing. You simply lie on your side and the doctor places the tip of the instrument just below your earlobe. You'll hear a clicking sound and the adjustment is complete. How does it work? First, digital imaging tells us the degree of your misalignment. Using your measurements and precise calculations based on the principles of percussion force, we program the adjusting instrument to send an energy wave with just the right amount of force through the tip. You won't feel the force, but it pushes the atlas back into alignment, just like that. And once your Atlas is back in place, your spine straightens up and your nervous system can get back to work - all of which restores your body's ability to heal itself naturally, without drugs or surgery. To learn more about how the atlas orthogonal procedure works, click here to watch a short video about it. You can also visit the Official Website Of The Atlas Orthogonal Program. If you are interested in learning more about this technique, or if you think you could benefit from an adjustment, give us a call or send us an email. We would be happy to provide you with a complimentary consultation to discuss how Atlas Orthogonal can help you to get healthy and stay healthy. Fun Fact -Your Atlas gets its name from THE Atlas of Greek mythology. You know, the guy who held the world on his shoulders. Why? Well, the atlas weighs a mere 2 ounces more or less, but that tiny bone bears the weight of your head, which can weigh anywhere from 9 to 17 pounds!